Cross-strait relations won’t be the biggest challenge Tsai will face if she wins the presidential election next year. Much emphasis has been given to how Taiwanese opposition leader Tsai Ing-wen defines the status quo and how she views the ’92 Consensus. However, her real challenge will be addressing domestic politics, not cross-strait relations. All indicators point to Tsai being elected president of the Republic of China. Her Nationalist Party (KMT) rival Hung Hsiu-chu (Taiwan’s Sarah Palin) is a weak candidate that many in the KMT would like to replace if it weren’t too late. Vice President Wu Den-yi does not poll well. Even if KMT Chair Eric Chu should reluctantly get into the race, Tsai will prevail. When former KMT member and current People’s First Party Chair James Soong announced that he was seeking the presidency as a pan-blue (pro-KMT) candidate, he seemed to offer a challenge to Tsai. Soon after his numbers dipped to the point that he is not a factor. In his last presidential bid in 2012, he was seen as a decisive factor but only received 2.77 percent of the votes. The real contest is going to be for control of the legislature, because that is where the domestically focused policies of economic growth, rice bowl issues, political reform, and security that are at the center of Tsai’s campaign will live or die. Tsai’s Democratic Progressive Party (DPP) must pump life back into the hollowed out Taiwan economy created by the KMT and its big business supporters. Former DPP Minister of Finance Lin Chuan and DPP Secretary General Joseph Wu envision an economy with more domestic focus, guided by industrial policy with government subsidies to struggling industries, and more attention to small and medium businesses. While they advocate cutting red tape to spur economic growth, it’s difficult to see how they would do so given the government role in the economy that they anticipate. They also emphasize free trade agreements (FTAs) with other countries. That is unrealistic, however. The China-friendly KMT has only been able to complete FTAs with Singapore and New Zealand because of Chinese interference. Attempted agreements with Chile, Australia, and Malaysia are cases in point. The Sunflower Movement was a demand for more jobs and a more promising future for Taiwan’s young. To satisfy such, Tsai must persuade Taiwan companies to come back from the mainland, create jobs in Taiwan, and move Taiwan up the ladder of value added production. To accomplish that, she must win the support of the big business community while at the same time not ignore the wishes of small and medium businesses. Big business represents the interests of the Taishang or Taiwanese companies that make a large portion of their money in China and who could pressure Tsai to adopt a more conciliatory – Ma-like – China policy which the DPP would not readily embrace. 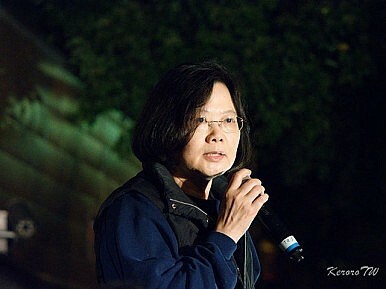 “Rice bowl” issues constitute another component of the domestic challenge to Tsai. Buying a house is beyond the reach of most young people. The public is fed up with the high electricity charges of Taiwan Electric’s, a government owned enterprise. Particularly after the disaster in Fukushima, ideas to supplement Taiwan’s energy supply with nuclear power have filled the streets with protesters. Wages have remained suppressed for a number of years with wages for new college graduates hovering around $800 per month. Taiwan has a national health plan envied by many countries; however, the cost continues to climb. Despite its transformation from a brutally, authoritarian state to a vibrant democracy, Taiwan cries for political reform. Substantive political reform in Taiwan requires wholesale amendment or even rewriting the 1947 Republic of China Constitution, which was written to govern China during an era in which the Republic of China still controlled mainland China. As such, constitutional reform would cause rancor and possible violence, such as we have seen too much of in the legislature and characterized the 2014 Sunflower Movement. Many feel that the Control Yuan, an investigative body, and the Examination Yuan, a kind of Office of Personnel Management, are sinecures for political supporters that waste resources and whose functions are duplicated by other parts of the government. The young of Taiwan want the voting age lowered. Many in the DPP and others call for constitutional change, noting that in the 2012 legislative election the KMT got 48.1 percent of the vote yet claimed 63 percent of the legislative seats; by contrast, the DPP got 44.5 percent of the vote yet only won 36 percent of the seats. Tsai will inherit Ma’s poorly conceived and executed plan to transform the Taiwan military to a force highly dependent on volunteers with an adequate level of personnel. In line with a long standing Washington concern, the DPP has promised that it will secure a military budget equal to 3 percent of GDP. While Washington would welcome that, it is unlikely to play well to a domestic audience given the poor public image of the military, a feeling that military expenditures are a waste of money, and the propensity of politicians from both parties to spend public money in ways that will help them to get re-elected. Whether it retains its majority or finds itself in the minority, the KMT will seek to derail or embarrass Tsai at every step of the way. As is the practice with Taiwan politics, the KMT could try to force Tsai’s premier to resign. Or as the KMT tactic was with Chen Sui-bian, seek to impeach Tsai. Under the leadership of Tsai Ing-wen, the DPP has become a less ideological and far more pragmatic party. Nevertheless, there is the prospect that the deep green (deeply pro-independence) will want to push Tsai to adopt a more pro-independence stance. Chen Sui-bian started his presidency by reaching out to China only to have the most pro-independence elements of the DPP bolt the party and join the unyieldingly pro-independence focused Taiwan Solidarity Union. Chen subsequently retracted from engagement with China. To ensure the widest scope of support among swing voters, the young, and some of Taiwan’s newest political parties who are trying to gain a presence in the legislature, the DPP has chosen not to run a candidate in certain legislative districts. Instead, it will support select new party candidates with the understanding that if elected that they will support the DPP. In such a scheme will those elected to public office still support the DPP? William E. Sharp, Jr. is host of Asia in Review. The president-elect has pledged “no surprises” in cross-strait relations.